Is this modular smartwatch the next Pebble? 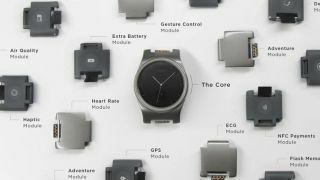 Smartwatch company Blocks Wearables made waves last year by promising the first modular wearable, and now its finally launched its Kickstarter. So far there are 37 days to left to back the project but it's already surpassed its $250,000 (about £160,000, AU$350,000) goal. It didn't break any Pebble records, but there's obviously interest in the smartwatch. Starting at $195 (about £128, AU$270), the standard Kickstarter package gives you the Core, four modules of your choice and an adjustable clasp, which will fit all wrist sizes. For an extra $30 (about £20, AU$42), you can get more modules tacked on. You can also order an unlimited number of modules, and redeem your credit from Kickstarter at any date to purchase modules that are released in the future. The Blocks watches will be compatible with both iPhones and Android smartphones, working with iOS 8 and above on iPhone 4S and above. It also works with all Android 4.0 and up phones. Color options at the moment only include Onxy Black, Sunrise Red and Marble White. The overarching message of Blocks is customization beyond the color of the straps and the watch face as Apple Watch and Android Wear have fervently touted. With Blocks, the actual strap is made up of modules that you can swap out depending on your needs. GPS, heart rate monitor, extra battery life, NFC and more are just a few of the modules you can pick from. Basically if you're going camping, put in an extra battery. Going for a run? Swap in the GPS and pedometer, and so forth. With the core, or the main watch body, you'll get phone notifications just like any other smartwatch, along with voice control, color touch screen, Bluetooth, Wi-fi and haptic feedback. The watches are IP67 certified meaning they can withstand immersion up to 1m for a short period of time but Blocks is working towards an IP68 rating which will allow you to swim and shower with the smartwatch. Expect the Blocks smartwatch to ship in May 2016.